The possibilities and pitfalls of leading a double life are on display in Oscar Wilde’s “The Importance of Being Earnest,” performed by the Rose Drama Club February 2 -10. When two friends lead double lives it means double trouble in the Rose Drama Club’s production of “The Importance of Being Earnest” at Rose-Hulman’s Hatfield Hall with five shows February 2 - 10. The stuffy world of Victorian England is turned upside down when two young friends assume false identities in order to live outside of their inherited social strictures and have a little fun on the side. Things are going along just fine until both men fall madly in love while using the same false identity. This gets even stickier when the objects of their love believe they are engaged to marry the same man. 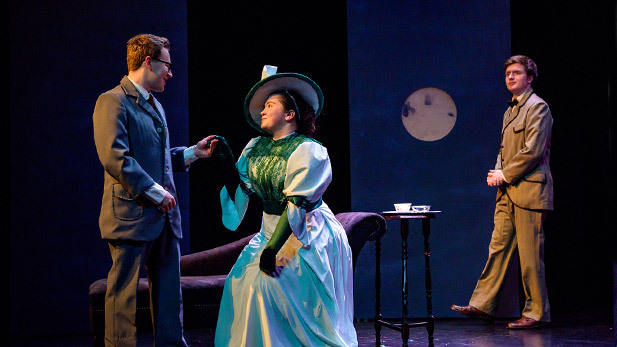 Not just a zany romantic farce, Oscar Wilde’s “The Importance of Being Earnest” is also known for its thought-provoking social commentary and satire. It has been a theater mainstay since first hitting the London stage more than 100 years ago. “The actors and tech crew have recreated the period of the 1890s to a tee, which is part of the fun of this great comedy of manners,” says director of theatre programs Terence Hartnett, assistant professor of English at Rose-Hulman. You’ll love the Rose Drama Club’s performance of this theater classic. Tickets are just $15 for adults and $10 for those under 18. Friday and Saturday shows are at 7:30 p.m. on February 2, 3, 9, and 10. There’s also a 1:30 p.m. matinee on Sunday February 4.